Where are the biblical manuscripts of the OT and NT currently located? Where are the actual texts of the OT and NT kept? The actual extant (still in existence) manuscripts for the texts of the Bible are held in a variety of locations. Most of them are kept in Libraries, Museums, and Monasteries around the world. Some of the manuscripts are also in people’s personal collections of ancient documents. The Leningrad Codex (one of the oldest Hebrew manuscripts of the Hebrew Bible/Old Testament) is located in St. Petersburg, Russia, in the Russian National Library. This particular manuscript has been there since the mid-1800's. 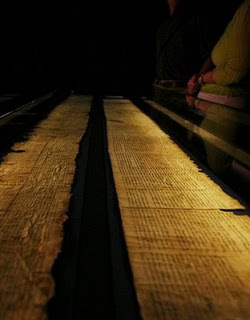 The Dead Sea Scrolls and other copies of manuscripts, including the Aleppo Codex, are housed in “The Shrine of the Book” at the “Israel Museum” in Jerusalem. The Codex Sinaiticus (one of the major NT manuscripts) is located in four different places: St Catherine's Monastery, the British Library, Leipzig University Library (Germany), and the National Library of Russia in St Petersburg. The British Library has the largest portion of the manuscript, which contains the whole of the NT. If you are interested, the Center for the Study of New Testament Manuscripts has been working on taking digital photographs of all of the manuscripts of the Greek NT that are still in existence. Their extensive “manuscripts” page list these manuscripts and where they are located. You can also actually see images of these ancient manuscripts. There is also a digital interactive copy of the Aleppo Codex (OT) available online. A quick Apologetics note: The manuscript evidence that we have for the Bible is staggering compared to other ancient documents. There are thousands of copies of early biblical manuscripts, and the majority of the textual variants (places where one copy differs from another) concern very minor details. This evidence demonstrates the quality of the documents behind our major English translations.